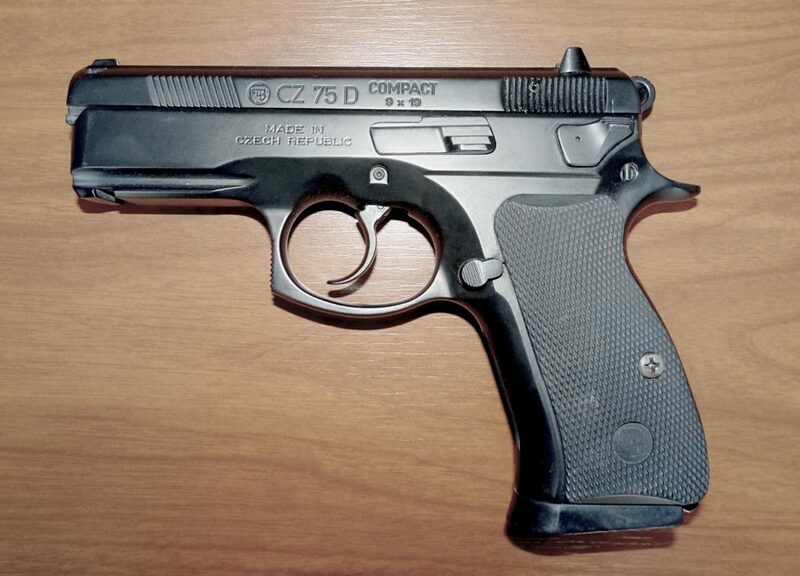 Whether you’re in search of your first concealed carry weapon, or it’s time to pick up a new sidekick weapon, we think everyone should consider the CZ 75 Compact. It’s a fantastic weapon that is just the right size for a compact. Although it has a steel frame, it’s still very lightweight, and it’s touted as the “softest-shooting compact of the CZ 75 line.” You’ll need a holster for your new concealed carry! This is our review of the best CZ 75 Compact holsters for the money. We’ll let you know which one we chose as our favorite at the end. We sifted through a variety of leather and kydex holsters to find the best ones for the CZ 75 Compact. There’s something in here for everyone. Thankfully, there’s no shortage of options for a well-reviewed pistol such as this one! Materials – This first choice from Barsony is simply designed and budget friendly. 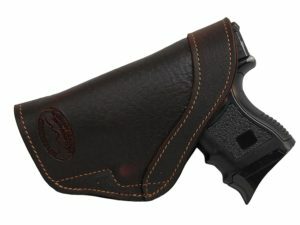 It’s an inside the waistband compact holster that is made entirely of premium cowhide leather. It can be purchased for left handed or right handed shooters, and it’s available in black, dark brown, burgundy, or natural tan. The basic design allows the gunowner to wear the holster strongside or at the small of the back. There is precision stitching throughout. The leather has been reinforced along the entire exterior edge, and there is additional reinforcement at the opening of the holster to smoothly guide your weapon as you draw. There is a single, standard metal belt clip for attachment to the waistband. 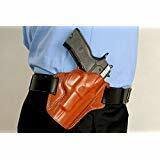 Performance – We normally steer away from holsters such as this. They’re pretty basic; however, for something like the 75 Compact, a soft leather IWB holster like this one from Barsony works perfectly fine! The weapon is small enough that it doesn’t make the single belt clip ineffective. You may even prefer this style over others because it’s so easy to conceal! With this in mind, there’s no sweat guard. The leather is comfortable against the body, but your pistol grip might not be. Wearing an undershirt or an extra t-shirt can help eliminate any discomfort. What we say – This would be the best CZ 75 Compact holster for individuals with a small budget for a holster or those with smaller body frames. You shouldn’t feel much discomfort if your clothes and waistline fit you comfortably! Precision stitching, light weight (only 4oz) and is made in the USA. Made from U.S. double shoulder 7oz weight cowhide. It will accept belts up to 1 3/4" width. 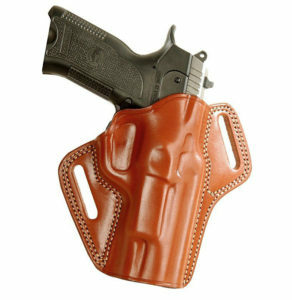 Materials – The outside the waistband pancake holster from MASC is available as a right handed draw holster in tan. However, you can find this popular choice for left handed draws or in black from other sellers. The premium leather has been molded to the shape of your weapon, and it gets additional retention from the two belt loops. Simply tighten your belt to improve the carry height and increase the retention on your CZ 75 Compact. There is double stitching for additional reinforcement around both belt loops as well as along the barrel and at the trigger guard. Inside the holster is some additional space along the rail to protect both the pistol and the interior of the leather. MASC has avoided any thumb breaks to allow for a fast, smooth draw. Performance – Yes, we chose a tan pancake holster over seeking out a black one. If you do a little searching, you can easily find black pancake holsters to accommodate your CZ 75 Compact. Since this pistol is smaller than a full-sized handgun, you can get away with relying on retention from your belt and the leather’s molding. A thumb break may not be totally necessary. Unfortunately, you don’t get the option of wearing this with a forward cant. As long as you’re comfortable with a straight draw that’s a little high up on the hip, you should be able to pull your weapon free quickly and swiftly! What we say – This is the best CZ 75 Compact holster for shooters who bring their pistol out to the range and also need conceal carry. It’s a great holster to accompany your target practice, you can still throw a thick shirt or jacket over the holster for concealment. HISAR Made from Premium Genuine Leather. Hand-made molding for perfect fit. Open top for fast drawing. Sight rail space to protect the leather and muzzle sight. The PANCAKE design keeps the weapon close to the body. Enhancing concealment. The construction is designed to fit the natural curve of the hip, keeping all the molding up front. Double stitch provides high durability. Fits up to 4.5 - 5 cm belts. Materials – Moving on to kydex, we have this inside the waistband hybrid holster that has a variety of materials in the construction. The kydex portion houses your weapon and protects it from scratches and dents if you were to ever bump into something. The kydex is bolted in place by six screws, which can all be tightened or loosened for preferred retention. There are also two metal belt clips that can be adjust for carry height and style. Choose between a straight up and down carry or FBI forward cant. There is a stiff leather back panel that is made with flexible leather and comfortable suede. The suede backing allows the gunowner to wear the holster during long periods of time. The back panel also acts as a sweat guard to protect your weapon and increase comfort. Performance – We’ll address this right away: sometimes hybrid holsters can be a little “too much holster” for compact weapons. Admittedly, this will hold true for some gunowners. For others, you just can’t beat the perfect combinations that come with a hybrid holster as well as the versatility. You get a lot out of it that you’re not going to get with a lot of other holsters. You get a fantastic sweat guard here, so you can comfortably wear the holster during a lot of activity. Also, being able to adjust the belt clips is a big plus. 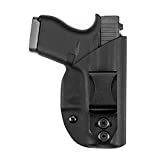 The kydex portion of the holster is highly protective and resistant to damage, but you still get the comforts of suede and leather organically curving against your waist. Some gunowners like the finer things in life, no matter the size of their concealed carry! What we say – This is one of the best CZ 75 Compact holsters for those who rely on the comforts of a sweat guard and want versatility and adjustability. Your pistol isn’t going anywhere in this baby. 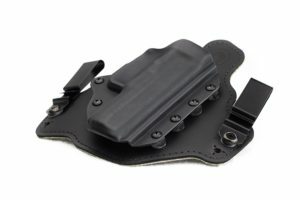 Materials – Vedder offers its own kydex inside the waistband holster, which is significantly more low profile and discrete that the previous option. It is not a hybrid holster, so the entire product is made with ultra thin kydex. It has been molded slightly to retain your pistol, and there is a retention screw at the trigger guard. A single metal belt clip is attached with two adjustable screws. The wearer can choose between their preferred ride height and cant angle. The other side of the holster features a sweat guard, so your CZ 75 Compact is protected during use. This product is only available in all black for a discrete appearance. Vedder Holsters provides a 30 day money back guarantee as well as a lifetime warranty. Performance – Forget about leather! Maybe you’re all about the kydex. If you want something that will be more resistant to bumps and bangs than leather, look no further than this ultra discrete 100% kydex IWB holster. It even has a sweat guard! It may not be as large as the sweat guard on the hybrid holster, but it’s just enough to get the job done. You get that little bit of versatility in carry angle as well. There is some give and take with the comfort level. On one hand, kydex is incredibly thin, so it won’t create a bunch of bulk inside your waistline (also making it ideal for inside the waistband carrying). On the other hand, it’s not soft like leather, so you may have to do a little adjusting for it to sit in just the right spot on your hip. What we say – This will be the best CZ 75 Compact holster for those who want to avoid scratch-prone leather and care much more about protecting their pistol than an appealing appearance. This holster is very low profile – perfect for concealed carry. We chose the MASC Holster Leather Pancake Holster as our favorite holster for the CZ 75 Compact. A pancake holster can be one of the best options for a compact weapon! 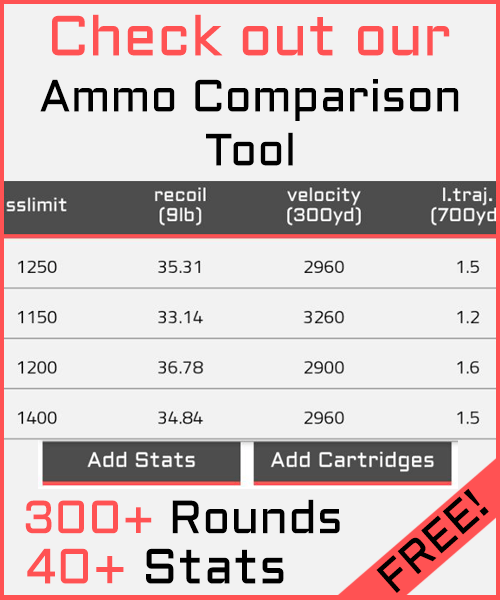 You get perfect retention without slowing down the speed of your draw. Between the molding and the attachment on your belt, your CZ 75 Compact will stay safe and sound, and there’s no pesky thumb break to interfere with grabbing your grip. You can still conceal the holster when necessary, and there’s no chance of anything sliding around during the day.